On track, start at corner. Rinse and repeat to complete two laps. Turnimus Qs 9 as the Pax welcomes Thin Crust. Over Head Claps x 15 I.C. Imperial Walkers x 15 I.C. HIgh Knees in place x 15 I.C. 200 LBCs per team (core), once completed plank up. 300 squats per team (legs). Low Flutters X 15 I.C. High Flutters x 15 I.C. Low Dollys x 15 I.C. High Dollys x 15 I.C. Since the launch of HANGAR 1, this may be the first time on a Saturday that we’ve had single digits. Subprime is still Q’ing every Tuesday and Thursday and seems to have a good core of 3-4 guys there. Speaking of Subprime, his persistence on EH’ing via the Nextdoor platform continues to draw FNG’s as we welcomed Thin Crust. He’s an experienced ex tri-athlete who came locked and loaded already sporting HANGAR 1 gear….as an FNG!! Keep giving it away gentlemen, it works!! Continued prayers for Edison’s newborn daughter, who’s made it home after heart surgery. Next week, we have our first V.Q. at HANGAR 1 as Droid is stepping up to the plate. I’m always excited to see what new beatdowns I get to endure. Also, #cervezasalute. If any brothers from HillYeah! feel like coming out, we’ll have a frosty beverage waiting for ya! Get there!! Bada Bing coaches up the PAX. Light skip – “Deon’s” – Carioca – alternate every 25 yards, repeat for a full turf lap. PAX of 12 Warms up for Memorial Day Murph with a Murph. The PAX of SF Peninsula will perform The Murph for the third year in a row. Turnimus Qs a Block Brigade of 16 at HANGAR 1 as F3 welcomes 3 FNGs. Indian Run lap on the track. -Single-file line of runners in which the last guy sprints to the front. Rinse, repeat. -Mosey to Y.H.C. truck and single file behind the truck (16 deep), we continue to unload 23 lb retaining wall blocks, brigade style. As instructed by the QIC, we kept the blocks overhead, until everyone had a coupon in the air, then we walk back to the A.O……blocks overhead the whole way. Line up at goal line, blocks in front of you. -Sprint to the 25 yard line, 25 merkins, run backwards to the goal line, plank up and wait for the 6. -Sprint to the opposite 25, 75 Mtn. Climbers, run backwards to the goal, plank. -Sprint to opposite goal, 100 SSHs, run backwards to opposite goal line, plank. -Rinse and Repeat with coupons in hand the whole way. -Rinse and Repeat withOUT coupons. Black Snake lap on track. -Take an Indian Run, but the last guy has to weave his way through the Pax to the front of the line. Line back up at goal line in front of your blocks. With blocks in hand, we did a bicep curl to overhead shoulder press back down to a reverse curl. x 15 I.C. -Rinse and Repeat for a 2nd Set. Circle up at 50, on your 6, coupons overhead. -Low Flutters X 15 I.C. -High Flutters X 15 I.C. -Low Dollys X 15 I.C. -High Dollys X 15 I.C. Rinse and Repeat for a 2nd Set. Coffeteria at Roger’s Deli seem to suit us just fine. Plenty spacious, coffee as black as my badass black F3 shirt and plenty of breakfast options. I’m just not sure what’s harder, the 60 minute beatdown we endure at 7am or the decision to stay away from the bacon covered maple bars? Lastly, pre-orders for HANGAR 1 shirts end on Thursday the 24th. We are fully funded so the shirts will go to print and will be sent out and delivered by mid June but once the pre-order ends, this design wont be available for purchase. If you’re looking for some new F3 SF PENINSULA gear, this design is once again available. Pre-orders will be taken till 5/30. P.S. HANGAR ONE workouts every Tuesday and Thursday at 5:45am (45 min) and STEPS at Central Elementary in Belmont, every Wednesday and Friday, 5:30am (45 min). GET THERE! See you in the Gloom! 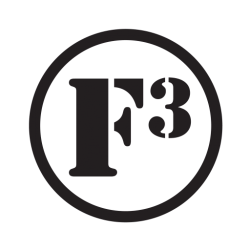 Sailor is back and Qs 12 as F3 welcomes FNG Sweeper.